Randomly Generated Mani – Would you? I’ve been trying get the number of untrieds in my stash down lately. I came up with the Randomly Generated Mani as a way to stop agonizing over what to wear when I was feeling indecisive. I plunk the size of my spreadsheeet into the handy generator at Random.org and click generate until it gives me something I haven’t tried yet. Sometimes I’ll look for a second, like this glitter topper, and off I go! Today I got SinfulColors – Opening Night, a dark teal shimmer. Opening Night stained my nails, despite two coats of base coat, so be careful with that one. 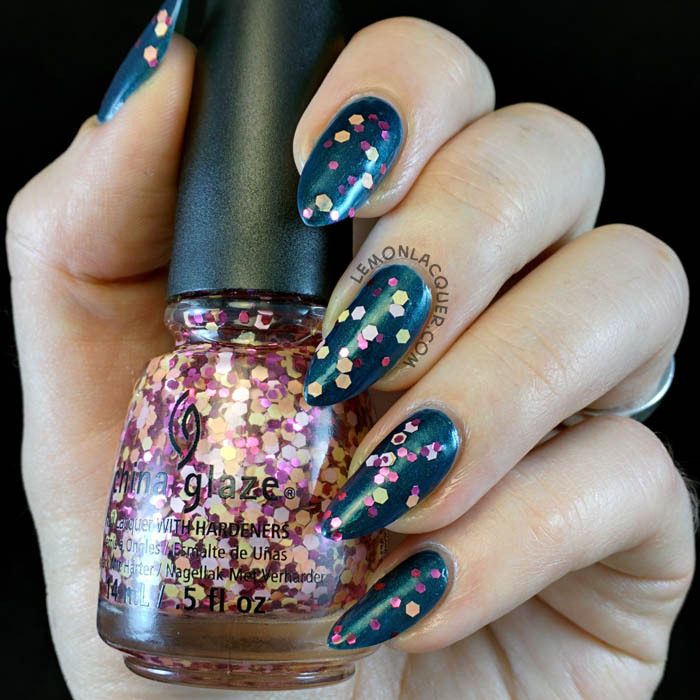 Use a thick base coat, at least two coats, and don’t use it over a pva glue base without something in between; the acid in the glue makes it easy for polish to stain your nails. 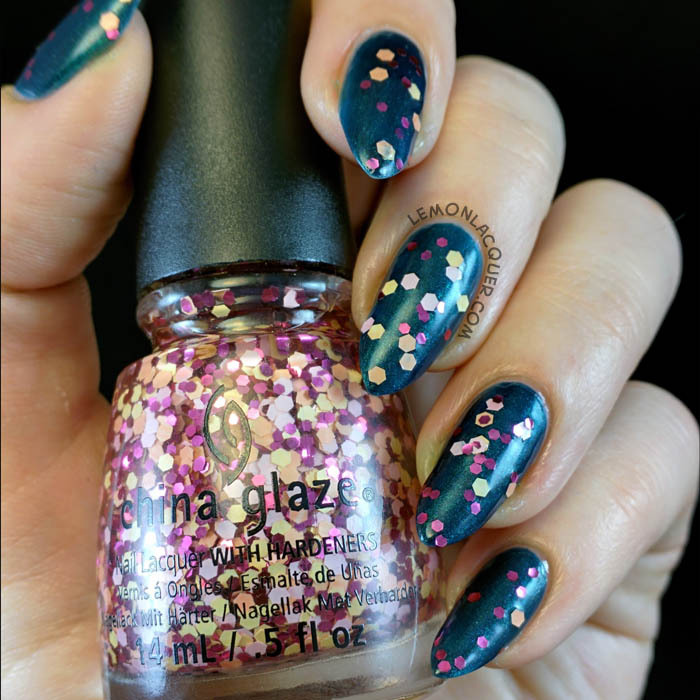 On top, a cheerful glitter topper from China Glaze – Glimmer More. This topper has small fuchsia hexes, and large pale pink, peach, and yellow hexes. Fishing glitter out is no problem, but application works best with a dab and spread method. The base is kind of thick, so all the glitter want to clump up in one place if you let it. Let me know what you think of this one. Would you ever let a computer choose your nail polish colours for you? Is your nail polish stash big enough that you need to? Tell me in the comments! Good morning, lovelies. I’m starting out the new year with a simple but pretty manicure in lots of colours. I’m so glad I made puppy eyes at my husband and picked up some of these KBShimmer flakies, because they’re so pretty! I have a short little post for you this Monday morning, because I wasn’t feeling well enough last night to finish the stamping on this. Bleh. I do really love it though. I think it’s a great Christmas manicure without being too over the top. It’s subtle, if you can call anything with that much gold glitter “subtle.” Check out what I used after the break. Hi, my name is Lesley Penney, and I first got into nails in the summer of 2014. I love nail art, cats, reading, and sushi, and I blog with the help of two feline assistants keeping an eye on me. I'm a Canadian living in the south San Francisco Bay area, trying to escape the heat.